With UFC light heavyweight king Jon Jones hoarding most of the mixed martial arts headlines this week, it’s easy to forget there are 23 other fighters competing tonight at UFC 152. That means there are 23 other bets that gamblers can invest in, because I don’t believe many will be laying dough on “Bones” as a 8-to-1 odds-on favorite against Vitor Belfort. For those who believe “The Phenom” can serve up an upset special, feel free to take him as a 5-to-1 longshot. 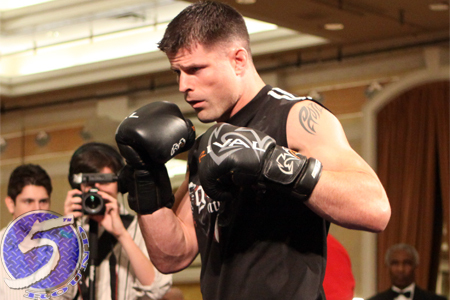 Perhaps the card’s most intriguing contest lies between middleweights Brian Stann (Pictured) and Michael Bisping. “The Count” checks in as a 2-to-1 favorite, while Stann comes in as a +160 underdog. The two got a tad heated during Friday’s weigh-ins, so this shootout could get interesting. Air Canada Centre in Toronto hosts Saturday’s festivities.